We are sooooo proud of the dog Mums and Dads we work with. We always explain everything we do – the why and the how. They are the prime carer after all – they’re with the dog every dog. Each dog gets their own tailored workbook after the first session of a personal massage and exercise – with annotated pictures of the dog. That means during the therapy session the carers can be active participants and not panic that they’re going to forget everything when Chris or I leave. Most carers understand how they can help with the healing process or the maintenance or prevention or any of the many multitude of reasons we have been invited round to help. And it shows when we go back for the second or third session, or from the feedback we get. Billy’s Mum, for example wrote “….We all slept like logs! No night barking, no midnight squabbles. Got to nearly 6 am before Bill decided he needed breakfast….. Hope we can continue as we’ve started……The other strange thing is that Billy keeps coming up to ASK for a massage!”. And the latest convert is Crystal’s Mum. Crystal is a Greyhound who exhibits intermittent lameness due to an existing hock injury. Being a Greyhound, she accepted massage therapy like an old friend. In fact, we had great difficulty asking her to turn over so I could work on the other side. We always tell carers that, if you are aiming for relaxation when massaging your dog and they have fallen asleep on one side, the last thing you want to do is flip them over. Make a note and do the other side on another occasion. We tell of our trick of our kitchen Blackboard. It has each of our dog’s names with the day of the week and the side we massaged that day. Means they don’t end up going round in circles with the massaged side! 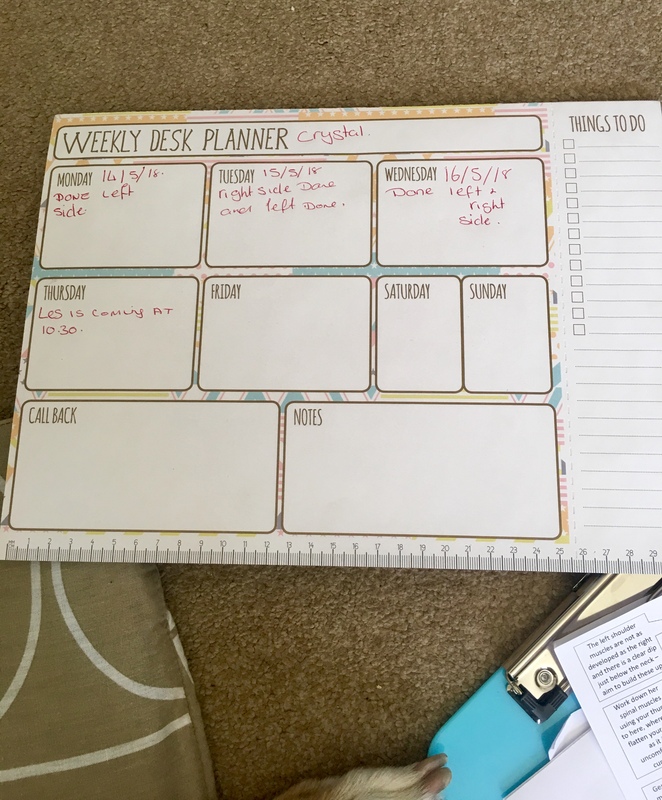 Imagine my joy when Crystal’s Mum showed me the weekly planner she has brought which she is filling in with “Done Left side”…”Right side done. And left done”……..
Dee & Crystal – you get a 10 from us! This entry was posted in acheypaw, achy paws, AchyPaw, achypaw myotherapy, Brighton Dog Massage, Dog massage, empowerment, massage benefits, multimodal therapy for dogs, myotherapy, not just arthritis, south coast dog massage, south coast myotherapy, Sussex, Testimonial, training and tagged acheypaw, achy paws, achypaw, achypaw myotherapy, achypaws, Canine massage, canine myotherapy, Dog massage, dog muscle therapy, massage, myotherapy, one to one training, prevention, south coast dog massage, south coast myotherapy, therapeutic massage. Bookmark the permalink.